Item Number : 01008-TRNFeature : PEARL WH TRUN FOR1005F , 1010TDi.. Item Number : 02043BKFeature : BLACK T/F BUNKBED KD VERSIONDimens.. Item Number : 02043BUFeature : BLUE T/F BUNKBED KD VERSIONDimensi.. Item Number : 02043RDFeature : RED T/F BUNKBED KD VERSIONDimensio.. Item Number : 02043RNBFeature : RAIBOW T/F BUNKBED KD VERSIONDime.. Item Number : 02043SIFeature : SILVER T/F BUNKBED KD VERSIONDimen.. Item Number : 02043WHFeature : WHITE T/F BUNKBED KD VERSIONDimens.. Item Number : 02091W-GRFeature : GREEN T/F FUTON BUNKBEDDimension.. Item Number : 02091W-PUFeature : PURPLE T/F FUTON BUNKBEDDimensio.. Item Number : 02091W-YLFeature : YELLOW T/F FUTON BUNKBEDDimensio.. Item Number : 02178BKFeature : BLACK T/T BUNKBEDDimensions : .. Item Number : 02178BUFeature : T/T BUNKBED KD VERSIONDimensions :.. Item Number : 02178RDFeature : RED TWIN/TWIN BUNK BEDDimensions :.. Item Number : 02178RNBFeature : RAINBOW T/T BUNKBEDDimensions :&n.. Item Number : 02178SIFeature : SILVER T/T BUNKBEDDimensions :&nbs.. Item Number : 02178WHFeature : WHITE T/T BUNKBEDDimensions : .. Item Number : 02178YLFeature : YELLOW TWIN/TWIN BUNK BEDDimension.. Item Number : 02188YLFeature : YELLOW T/T BUNKBEDDimensions :&nbs.. Item Number : 02359Feature : HEARTLAND HONEY O. T/T BUNKBEDDimens.. Item Number : 02417AFeature : HALEY TWIN/FULL BUNKBEDDimensions :.. Item Number : 02554Feature : HEARTLAND ESP. T/T BUNK BEDDimension..
TWIN/TWIN BUNK BED10170_KITDIMENSION: 98"x43"x68"HFEATURE: Espresso Finish.. Item Number : 19405Feature : KIT - WHITE TWIN LOFT BEDDimensions ..
Model Number: 2209+2335MDimensions:Width: 42 x Depth: 78.5 ..
Model Number: 2256BDimensions:Width: 42 x Depth: 78.5 x &..
Model Number: 2258KDimensions:Width: 57 x Depth: 78.5 x &..
Model Number: 2389NDimensions:Width: 42 x Depth: 78.5 x &.. Item Number : 30278Feature : TWIN TRUNDLE @NDimensions : 76".. Item Number : 30308Feature : TRUNDLE @NDimensions : 76"x40"x..
TWIN/TWIN BUNK BED37005DIMENSION: 81"x 43"x 75"HFEATURE: cherry finishPacka.. Item Number : 37009Feature : WHITE TWIN/TWIN BUNKBEDDimensions :&..
TWIN/TWIN BUNK BED37010DIMENSION: 78"x43"x65"HFEATURE: espresso finishPacka..
TWIN/FULL BUNKBED/LADDER/TRUND37015DIMENSION: 98" x 56" x 65"HFEATURE: Espr.. Item Number : 37015AFeature : JASON T/F ESPRESSO BUNKBEDDimension..
T/F BUNKBED W/2 DRAWERS37040DIMENSION: 79"x57"x65"HFEATURE: White FinishPac.. 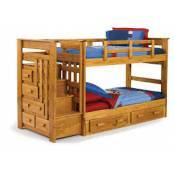 Item Number : 37115CFeature : MANVILLE OAK TWIN/TWIN BUNKBEDDimen.. Item Number : 37120CFeature : RYO ESPRESSO T/F BUNK BEDDimensions.. Item Number : 37125CFeature : RYO OAK TWIN/FULL BUNKBEDDimensions..
TWIN/FULL BUNK BED W/BOOKSHELF37136DIMENSION: 77" x 41" x 72"HFEATURE: Sand..
TWIN/TWIN BUNK BED37240DIMENSION: 79" x 42" x 65"HFEATURE: Silver/Brown Cof..